"This is easy, fast, and really delicious! Depending on how hungry you are, this can serve more or less people. Good for a dorm!" Pour hot sauce and butter into a large microwave-safe bowl. Microwave on High for 30 seconds, stir, then continue cooking until the butter has melted, about 30 seconds more. Stir sauce until blended, and set aside. Microwave chicken strips according to package directions on a microwave safe plate. Once cooked, toss chicken strips with butter mixture until completely coated. Replace chicken onto plate, and microwave on High for 2 additional minutes. Sweet and hot mustards make these a tasty alternative to regular wings. I did not enjoy this dish. I would not recommend making it. Maybe thats why it was never rated before besides me! Keep looking. These were GREAT! I made them in the oven, not the microwave. Very tasty, perfect for a football game with some ranch dressing for dipping. Like the recipe says, great for a dorm! 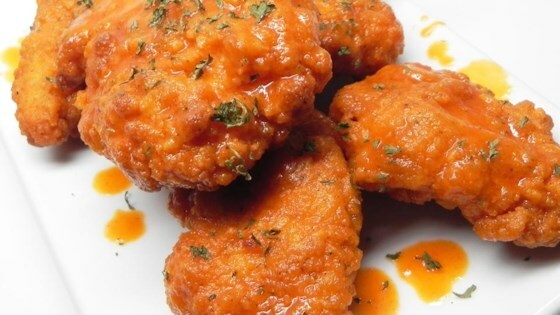 Butter & hot sauce is the traditional way to make wings (Red Hot, of course!) so have to give props for that too! Was Very easy to make! Thought it was better in the oven than in the microwave by far.... A little more hot sauce and a little less butter!